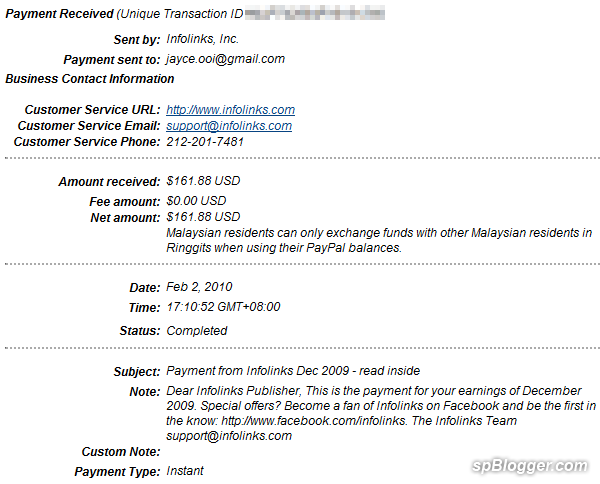 Yeah… Second Infolinks payment is in my hand now. I got it in my PayPal account now. It took me 3 months to reach the cash out limit. The first payment took 7 months. If nothing go wrong, the next one need only 2 months. It is what I call improvement and looking forward to get monthly payment from Infolinks. Infolinks pay rate is lower than Google AdSense but have higher click through rate. Maybe Infolinks does not look like an advertisement. What do you think? Next articleEnable Allowed Sites in Google AdSense?